DiSalvo’s Deli in Kettering, OH. COURTESY. 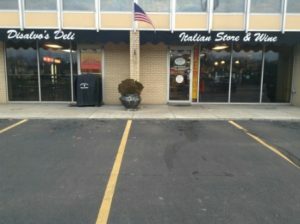 KETTERING – A local Italian deli offers a wide selection of upscale, hand-made Italian cuisine. At DiSalvo’s Restaurant and Deli, customers may choose from a wide selection of imported meats, soups, breads, cheeses, salads, desserts, and specials, owner Rinaldo DiSalvo said. DiSalvo’s menu changes every six days, offering customers a dynamic experience like no other. DiSalvo’s business model is based on Italian delis found in the east coast and Italy. “We are old school,” he said. DiSalvo’s Deli was started by DiSalvo and his wife Mindy in 1985 – about six years after DiSalvo’s family opened Mamma DiSalvo’s, a neighboring Italian restaurant. Originally from Italy, DiSalvo’s family moved to New York and eventually found their way to Dayton. “We always had a fascination with Italian foods from living in the east coast,” DiSalvo said. DiSalvo said he has enjoyed the loyalty of his customers, who appreciate the hard work that goes into his food. DiSalvo’s Deli & Italian Store is open from 10 a.m. to 7 p.m. from Monday to Saturday. It is located at 1383 E. Stroop Rd., Kettering.